Branding is a powerful tool for downtown revitalization and economic development — Yet, it is often misunderstood. Let Destination Branding for Small Cities show you how to develop and promote your downtown brand for economic growth. 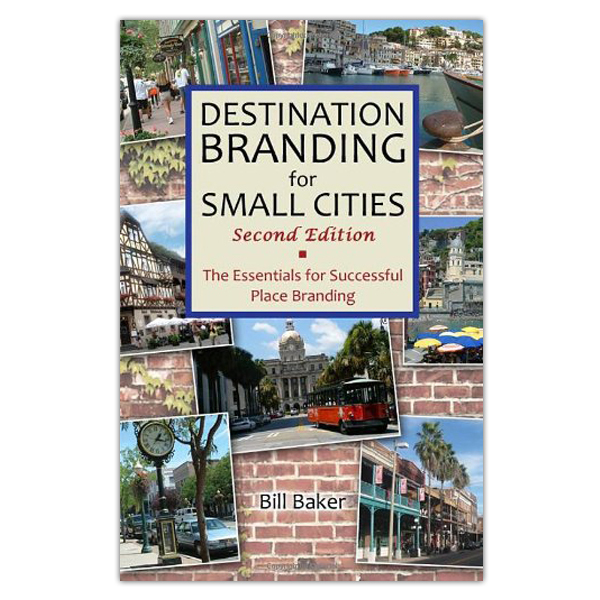 This fully updated and expanded second edition, cuts through the theory, advertising-speak and branding jargon to simplify and clarify the practice of branding small cities and downtowns for improved tourism and economic development. It guides readers through the entire process from understanding their place in the city and region, to expressing that brand in words and images, to keeping the brand fresh for years to come. You’ll find real world examples, plus proven tools, templates and checklists to help start or re-start your branding and marketing. What is being branded and why? Step One: Assessment — What’s your place in the world? Step Two: Analysis and advantage — What will you be known for? Step Three: Architecture and alignment — What is your relationship with city, state, regional, and other brands? Step Four: Articulate — How will the brand be expressed? Step Five: Activation — How will the brand come to life? Step Six: Adoption — How do you maximize the support of stakeholders? Step Seven: Action and afterward — How do you keep the brand fresh? Bill Baker is president of Total Destination Marketing, an internationally recognized place branding and tourism development group. He is recognized for creating successful brand strategies for places of all sizes throughout the world. Destination Branding for Small Cities is guaranteed. If you are not 100% satisfied, you may return it within 30 days for a full refund.